When winter hits, there's one area that we often wish was warmer than it is; the garage. If you have a detached garage that houses your vehicles or workshop, you may want to consider looking at a garage heater. These can not only make the air in the building warmer and more comfortable, but it can actually help when it comes to warming up the car or truck in the morning. 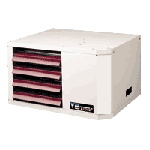 We offer a wide selection of electric and gas garage heating systems. We provide Heating, Cooling, Furnace & Air Conditioning Installation, Repair & Maintenance in Lanett, AL and the surrounding area.